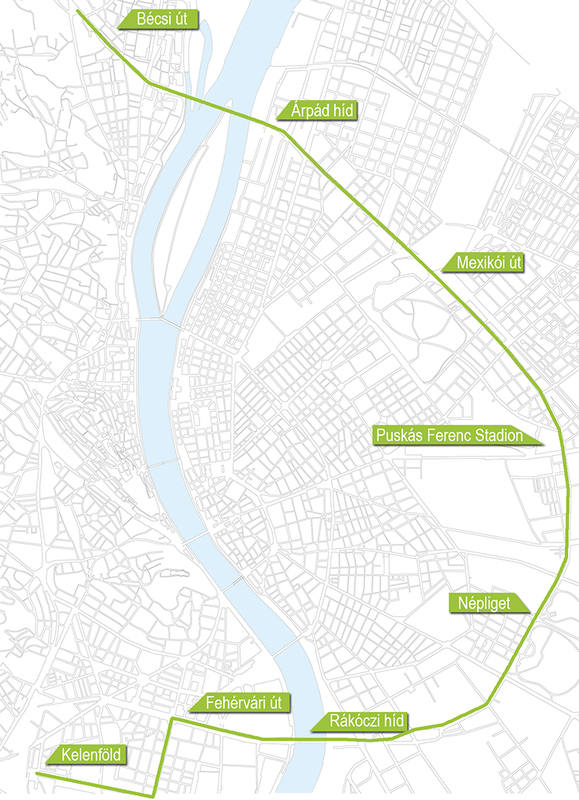 The first section of Budapest’s fourth metro line establishes a direct link between southern Buda and the city center. Before reaching its final station, the line connects traffic hubs and squares that play an important role in the city's operation. The renewal of these public spaces commenced in 2003 as an early phase of the Metro line 4 project. The design focused on incorporating all features and surface elements of the upcoming Metro line. Kosztolányi Dezső Square - The circle-shaped square has inseparable bonds with Feneketlen (meaning: bottomless) Lake. Using this urban composition as a given attribute, we emphasized the square’s circularity by arranging the constituents of space. Between the arched retaining walls we erected raised lawn surfaces to guide the circular path of the walkway. Móricz Zsigmond Circus – Green surfaces are designed to align with the famous 'Mushroom' building in the middle of the square. The arch of the southern residential building is highlighted by a line of small-crowned trees. The other side of the new driveway is vitalized with the placement of decorative plant cassettes raised to 45 cm in height. Bartók Béla Road - The aim of the design was to rehabilitate the Bartók Béla road and to create picturesque urban walkway with the preservation of the existing trees and façades. Szt. Gellért Square - The diversion of the existing tram tracks is justified by the future intent to adjoin an additional tramway from the southern direction along the embankment - this was considered a major design aspect. Another priority was the establishment of an entrance area worthy to match the world renowned hotel. Fővám Square – A two-way striped bicycle lane is established to connect Fővám Square with Astoria through Vámház Boulevard and Kálvin Square. The green areas surrounding Corvinus University of Budapest were constructed to harmonize with surface equipment of the metro station, and to highlight the qualities of the surrounding buildings by installing a dominant lime tree allée on the promenade and next to the university. Vámház Boulevard - The Boulevard’s double tree allée was restored to its former extent, planted in rounded grilles, incorporating a root guard at the bottom of the pit to protect public utilities. The pavement is made of a combination of bespoke "K" stones and small size block pavers to match the appearance of Kálvin Square. The greatest investment for Budapest in 2015 was the establishment of the Interlaced Tramway Network of Buda. The aim of the project was to create a traffic link between Northern and Southern Buda that has been missing for decades. Instead of Tram 17, there are altogether three tram routes operating along Bécsi Street and Frankel Leó Street: Tram 19, 41 and 61. Two tracks are constructed next to each other under Margaret Bridge as if they were interlaced the- hence the name of the investment. The tramway adjoins several squares which were also renewed and reconstructed within the framework of this project. 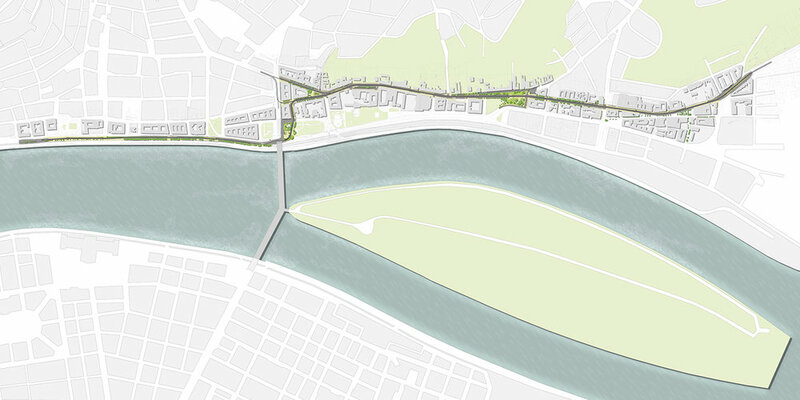 The design area includes the square bordered by Bem Embankment, the southern part of Germanus Gyula Park, parts of Frankel Leó Street and Török Street. The project also covered the complex spatial design for Zsigmond Square and the area between Zsigmond Square and Nagyszombat Street. The reconstruction of all these public spaces provided a possibility to determine a uniform image, which we aim to serve as a basis for similar traffic investments in Budapest in the future. 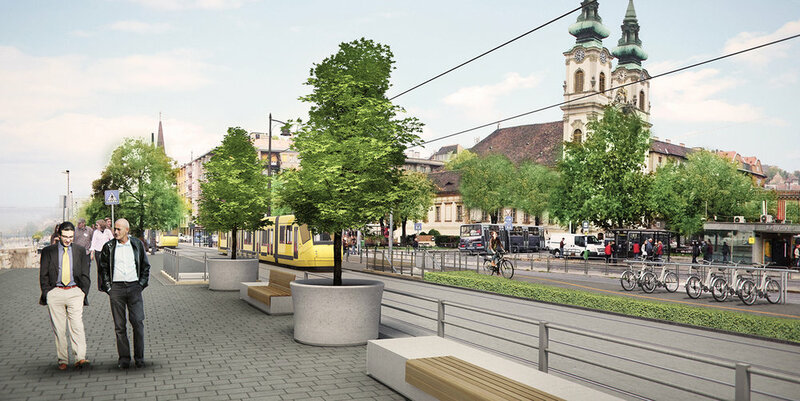 With the Interlaced Tramway Network of Buda implemented, Buda has not only been equipped with an efficient transport network but a number of renewed public squares as well. The head track of the road network leading to the Aquincum - Újpest Danube Bridge is part of a fully constructed circular system, which begins with Bécsi Road on Buda, passes through Aquincum’s Danube Bridge, follows the Körvasút track to cross the Danube once again through the new Csepel - Albertfalva Danube Bridge and finally connect to the M1-M7 motorway, with a total length of 32 km. As part of this multidisciplinary project Korzó was responsible for the rejuvenation of adjacent green areas. Interventions included the renewal of existing tree allees, the installation of new ones and the establishment of shrub and lawn surfaces. Besides purely functional aspects we also focused on adding environmental value, a green linear corridor to the road, increasing the aesthetic value of the area. In the compilation of the planting mixtures we made sure to use local, indigenous species and well-functioning planting combinations. In the early half of the 2000s, we prepared open space designs for Tesco stores in five different locations of the country: Cegléd, Dunaújváros, Kaposvár, Szolnok and Zalaegerszeg. Although some features and requirements were slightly different, we prepared a uniform design methodology. When it comes to designing such facilities, the establishment of large horizontal plane surfaces is a basic task. We separated each surface with low degree slopes and hedges & groundcover planting. Where possible, were framed the design area with a line of trees variegated by groups of schrubs. Naturally, all requirements of OTÉK (Building Code) were taken into account during the design of the parking lots. Newly installed trees were placed in the central zone of the parking strip, with raised edges protecting the green areas. Cycle stands and benches are placed at each main entrance, while waste collectors are located along the facade and at shopping cart storage units. Pedestrians are protected from car traffic with a line of fixed bollards. Successful road and rail-side tree planting can only be carried out within the framework of complex landscape planning. Trees are essential accessories of roads for noise and wind protection, while they also provide the benefit of blending this artificial element into the surrounding landscape. Linear tree planting restores disturbed landscape harmony, improves road aesthetics and ensures road safety by giving better optical perspective to the driver. Motorways and expressways: M2, M3, M6, M8, M60, M86. Arterial roads: Route 8, Route 10, Route 33, Route 62. 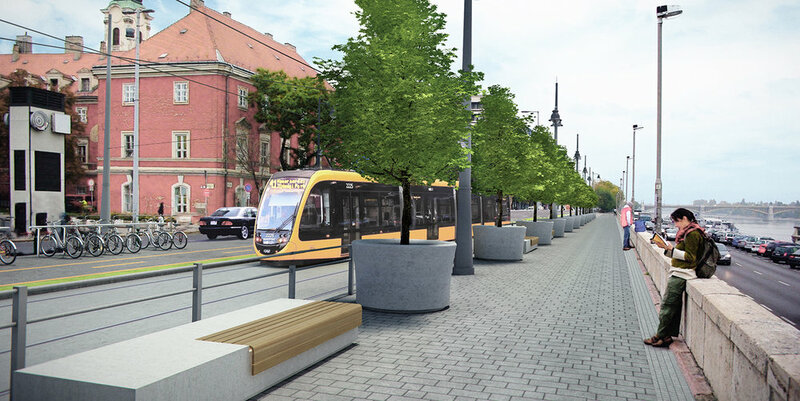 Task: Reconstruction of the tram track on its current axis, establishment of accessible tram stops, green areas and tree planting. Task: Construction of accessible tram stops, establishment of green areas and tree planting. Task: Construction of a track with accessible tram stops, establishment of green areas and tree planting. Tram 2 runs parallel to the Danube from Jászai Mari Square to Közvágóhíd. It is a panoramic route with remarkably unique features for tourists and local passengers alike, with its numerous touristic sites (Danube-river, Chain Bridge, Parliament) and scenic views to admire. Tram 2 is an inseparable part of the image of the Danube, its illustrious character makes it one of the ten most beautiful tram lines in the world. The reconstruction works aim at improving the accessibility of public transport in Budapest and increasing the quality of services to stabilize and even increase the number of public transport users. Having a well-defined and detailed technical design leads to an economic project with proper financing possibilities on the long-term. By commission of GYSEV Zrt., the line of GYSEV Railway no. 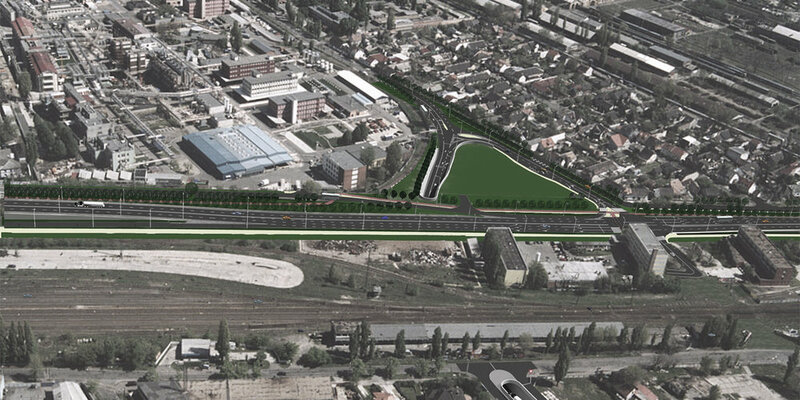 17. underwent a complex regeneration, including the modernization of road crossing and safety devices necessary for the electrification of railway line (Szombathely - Zalaszentiván). These interventions are supplemented by the development of passenger facilities, new telecommunication and spatial lighting networks and the revitalization of vegetation (woodcutting and planting works).